Luckily for us, we’re going to be taking a look at a product from one of the innovative companies today. 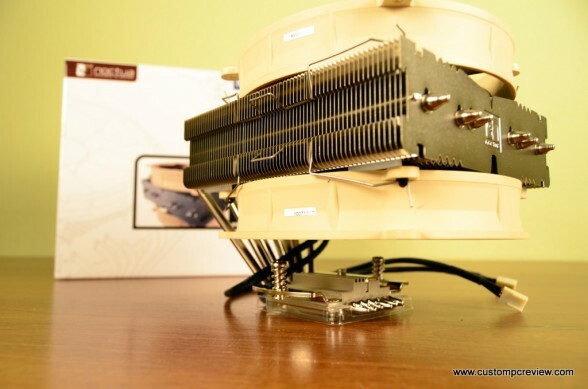 As a master of cooling technology, Noctua has a long list of accomplishments and awards trailing many of their products. Today we’ll be looking at the Noctua NH-C14. Following their usual creative trend, Noctua developed the NH-C14 primarily for quiet computing enthusiasts who want maximum performance. Aside from the unorthodox design, the CPU cooler packs six nickel plated heatpipes, dual 140mm fans, the SecrureFirm2 mounting system as well as an industry leading 6 year warranty. Excited? Yeah, me too. Let’s get started! Looking at the specifications, we can see that the noise level is rated at only 19.6 decibels. This means that even at full power, the fans will be near silent. With the low noise adapter attached, the noise level drops down to 13.2 decibels, which is near inaudible especially if the computer is a couple feet away. C-Type top-flow design The NH-C14’s six heatpipe c-type design allows for superb quiet cooling performance while maintaining a much lower profile than today’s tower-style coolers and providing excellent airflow over RAM modules and near-socket mainboard components. Dual NF-P14 FLX fans The NH-C14 comes with two of Noctua’s award-winning, premium quality NF-P14 140mm fans that can be fine-tuned according to the user’s needs via the supplied Low-Noise (L.N.A.) and Ultra-Low-Noise Adaptors (U.L.N.A.). Low Profile Mode Run with a single NF-P14 fan underneath the fin stack and with the top fan removed, the NH-C14 measures only 105mm in height, which makes it ideal for use in smaller enclosures and HTPC applications. 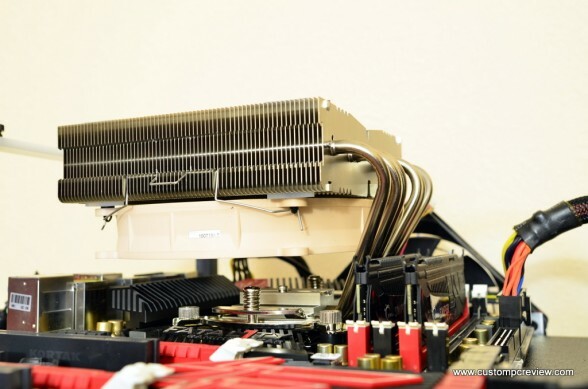 High Clearance Mode The lower NF-P14 fan can be removed in order to provide additional clearance for chipset coolers or RAM modules with tall heat-spreaders. Run with a single fan on top, the NH-C14 provides a full 65mm of clearance. SecuFirm2™ multi-socket mounting system Noctua’s enthusiast grade SecuFirm2™ multi-socket mounting provides broad socket compatibility (LGA1366, LGA1156, LGA1155, LGA775, AM2, AM2+, AM3, AM3+, FM1) and meets the highest demands in safety, performance and ease-of-use. Noctua NT-H1 high-end thermal compound Noctua’s much-acclaimed NT-H1 is a well proven pro-grade TIM solution that provides minimum thermal resistance, excellent ease-of-use and outstanding reliability. 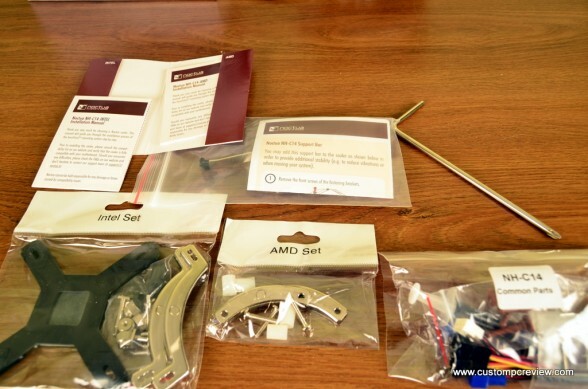 The accessories include separate mounting brackets for AMD and Intel sockets, MOLEX fan wire adapters, a user manual, a high quality screw driver, a tube of cooling paste, and other miscellaneous items. All bags are labeled and individually packed too. 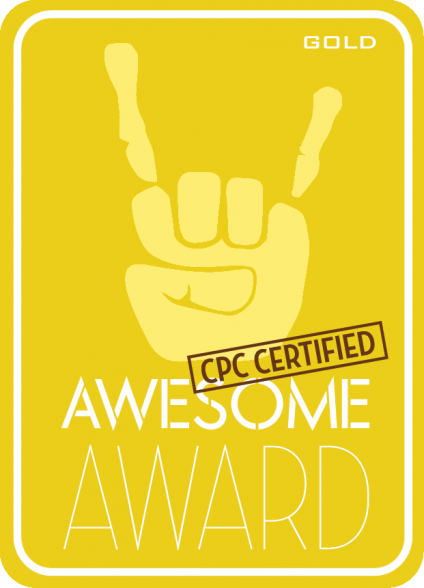 Wish more companies would do this… on everything! The brackets support LGA1366, 1155,1156,775 and AM2,AM2+, AM3, AM3+, and FM1. 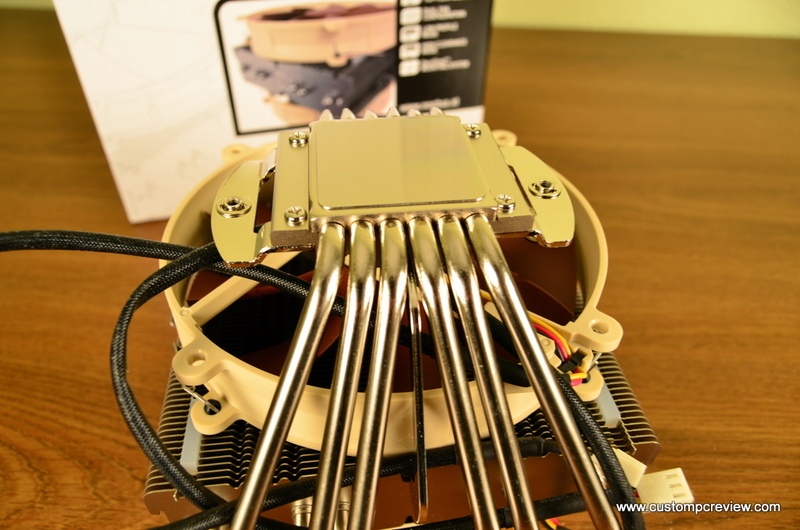 The heatsink includes two 140mm fans, which are non-pwm, so they use 3 pin headers. 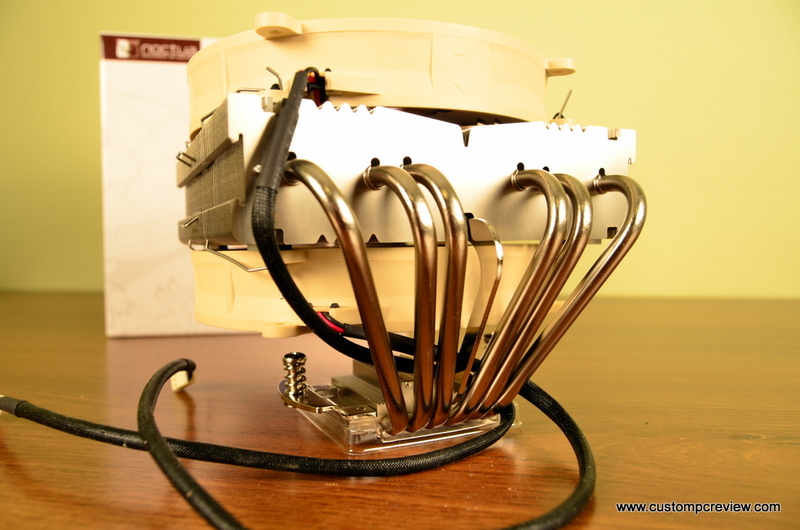 Noctua has also included a 3 pin splitter (one 3-pin to two 3-pin) so both fans can be connected to one 3 pin header on the motherboard. Additionally, the wires on the fans are sleeved, which look very nice. 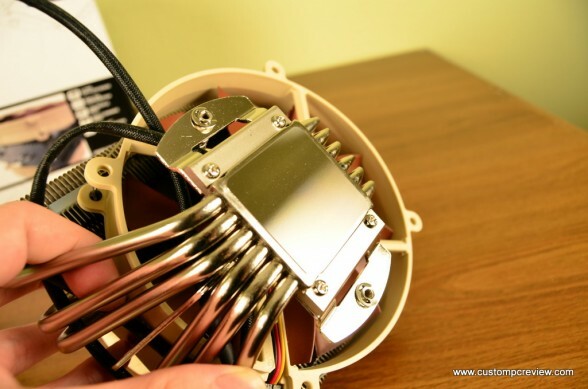 The fans are mounted to the heatsink using metal clips. This has pretty much become the standard lately for higher end CPU coolers. They are easily removable and are very secure. The two NF-P14 140mm fans spins at a rate of 1200 rpms and at 900 rpms /750 rpms with LNA and ULNA respectively. The fans use SSO bearings as well as a couple other features in order to minimize operational noise and increase lifespan. The base-plate has a very smooth finish and is free from all scratches and other imperfections. In addition to a thin layer of thermal paste, this should make excellent contact with the CPU. The six heat-pipes all extend from one side of the base-plate to the horizontally oriented heatsink, which help to create the distinct “C” shape. Installation was a breeze. The SecureFirm2 mounting mechanism was and is probably the easiest system to work with. You’ll most likely need the included screwdriver as you’ll need it to screw in the baseplate to the mounting mechanism through pre-cut holes in the heatsink. (These are only about big enough for the included screwdriver to fit) Otherwise, there’s only about 6 screws to worry about and the mounting system can be installed within minutes. Here’s a look at the NH-C14 installed. The cooler may be oriented in any direction, which makes it quite versatile as well. Additionally, the Noctua NH-C14 pulls air from the top and blows it onto the motherboard. This is especially nice because it creates a lot of incidental airflow to help keep the memory and the vrm area cool. With both fans attached, this cooler is almost as big as some of the traditional tower coolers out there. With the bottom fan removed, there’s a lot more clearance on the underside. This could be a life saver if the second fan collides with the RAM. As you can see here, we didn’t have that issue since our G.Skill Sniper memory is quite low profile. Similar to the previous scenario, there’s now a lot more room at the top with the top fan removed. This is great for a build in a narrower case, or a shorter case if you’re looking to put this into a media center PC. Finally, with no fans the heat-sink is, well, a heat-sink. Running this cooler with no fans may be a viable option if you have a system with a really low powered CPU and a lot of airflow in your case. Otherwise, this is not recommended. 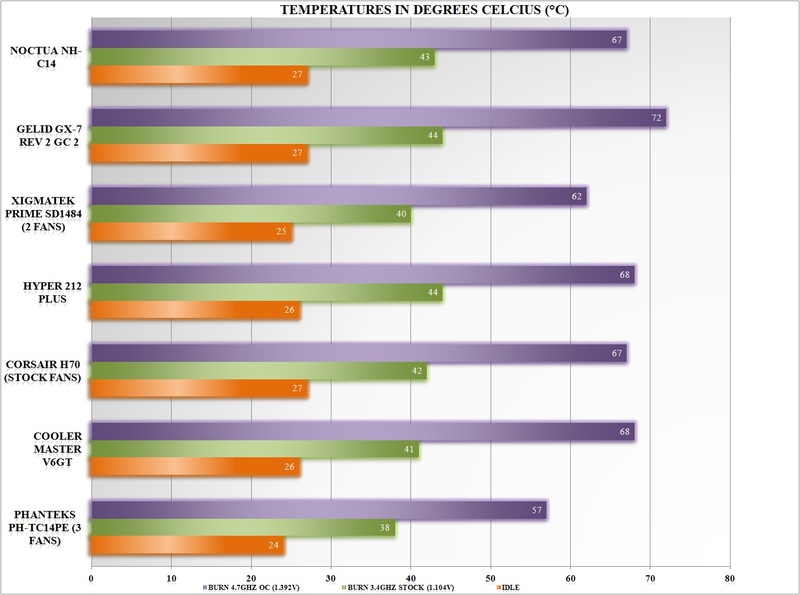 *All values in °C. Lower numbers indicate better performance. Bolded values denote best performance. One thing we noticed during testing is that this cooler is very quiet during operation. Even with the fans spinning at the maximum (1,200 rpms) the fans were quite silent. Additionally, the acoustic profile of the fan was very pleasing to the ear, giving off a nice smooth wooshing sound as air passes through the fans. 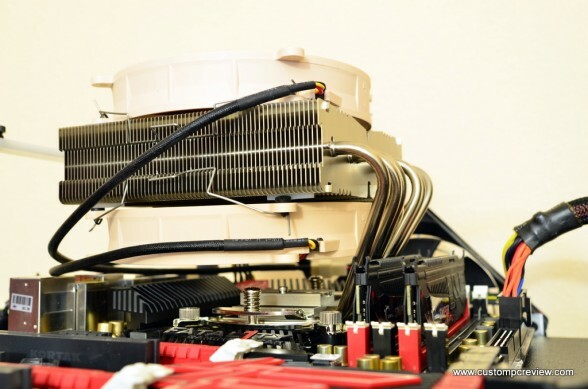 As far as cooling performance is concerned, we found that cooling performance is on par with the Corsiar H70 water cooler, and is only out matched when the clock speed is cranked up beyond 4.7GHz. However, in order to achieve that level of performance, the stock Corsair fans need to spin at a deafening 2,000 rpms while the NH-C14 spins at a quiet 1,200 rpms. Otherwise, the Xigmatek Prime SD1484 (large tower cooler) was able to beat out the NH-C14; however, it does sport dual 140mm fans similar to the NH-C14 and is comparable in price as well. Finally, just for your consideration, it may be worth nothing that this cooler does push air downwards onto the motherboard instead of out the back or top, which means case temperatures may be a bit higher when compared to other coolers on the market. With everything running, the Noctua NH-C-14 is quiet, even at full speed. 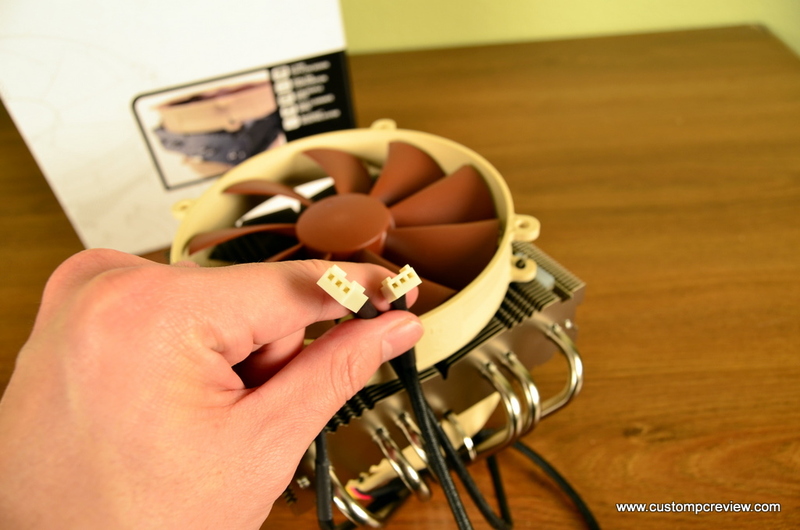 For those of you who have fan controllers or motherboards that support fan control, this fan can crank down very low – to the point where you can’t even tell the fan is on. 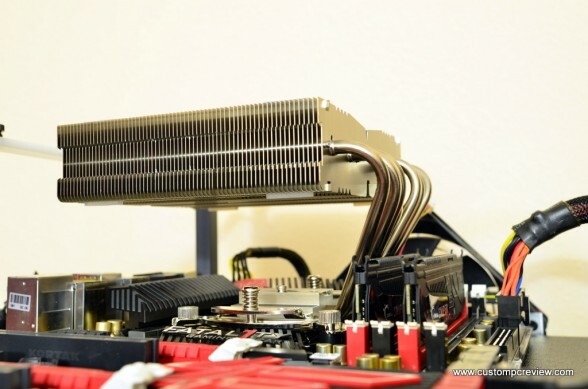 For those of you looking for the ultimate in quiet computing, this CPU cooler is probably it. I really wish it did come with some PWM fans though as most motherboards on the market do not have have the capability of controlling 3 pin fans by temperature. Cooling performance wasn’t something I could really complain about either. At stock clocks, the NH-C14 was able to keep our i5 2500K under 43°C at full load and it was able to keep our 4.7 GHz overclock under 67°C at full load as well. While it wasn’t able to keep up with the Xigmatek Prime SD1484, the temperatures were more than acceptable for the level overclock we had it running at. For those interested in running a more mild overclock such as 4.2GHz, 4.4GHz or 4.6GHz, the Noctua NH-C14 will no doubt be a great choice. The unique design of the heatsink means that it will be able to fit in smaller cases, especially in low clearance situations. Think HTPC or something of that nature. While most large tower coolers might have trouble fitting, this cooler will probably work just fine. 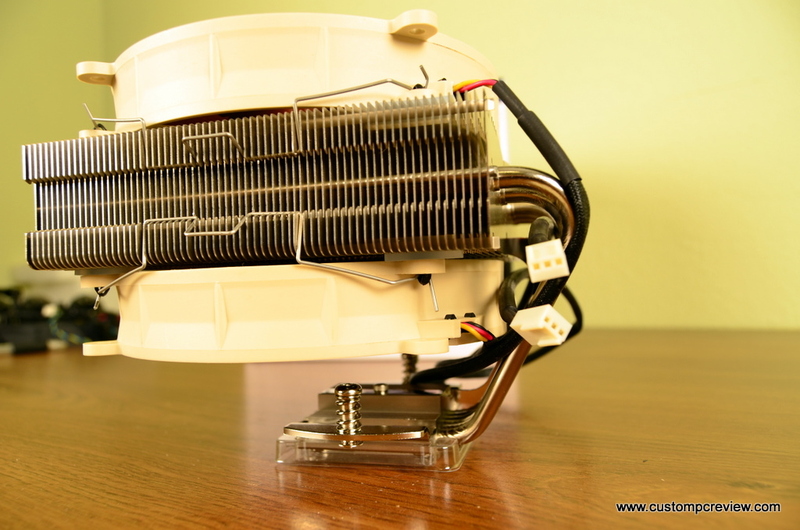 The entire heatsink can be mounted in any direction and the top fan or the bottom fan can be removed for additional versatility. 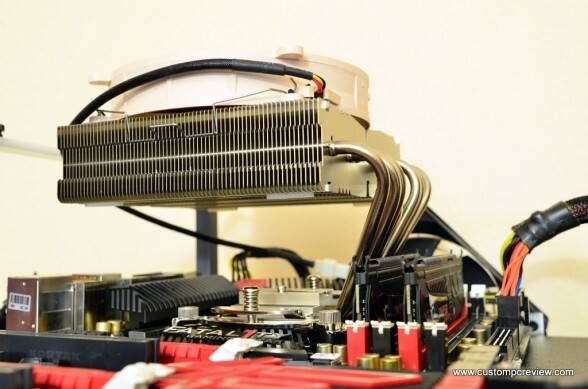 Additionally, because of the size of the heatsink, you will be able to get an unprecedented amount of cooling performance to the CPU in smaller form factor builds where tower coolers are not an option. Fans are not PWM. While the fans are quite silent even without PWM, it’s still definitely noticeable. With this cooler and with many most other Noctua products, you’ll really have to dig into your wallet. Coming in at $85, the NH-C14 may be an immediate turn off for people on a lower budget. Considering the slightly worse performing Hyper 212 Plus does come in at $60 cheaper, but isn’t that much farther away in terms of performance, there’s good reason too. Of course, with the Noctua you are getting a much higher quality product, so we’re not docking Noctua any points for the price, however it is your money, so it’ll be up to you if it’s worth the extra cash. 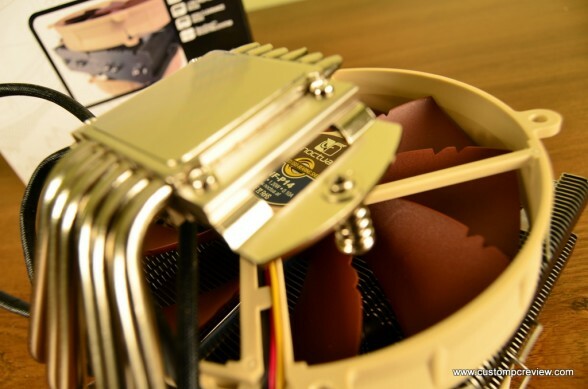 Overall, the Noctua NH-C14 boasted an excellent level performance while being very quiet. It’s highly recommended for those interested in putting together a smaller form factor PC or an HTPC, and want cooling performance simply unavailable to smaller tower coolers. Special thanks to Noctua for making this review possible. The Noctua NH-C14 is currently available on Amazon.